Bring one or more of your favorite people or come solo to this single-session class and try it out! This is a good way to see if clay is the medium for you, before signing up for a class. Finished work will be fired and ready for pickup about two weeks after your clay date for an additional $10 each piece. Perfect for a date, a group of friends or on your own, and learn to make a bowl on the pottery wheel. You are welcome to bring an adult beverage. Kids (6+) are welcome (not required!) at our family clay date. A family-friendly clay experience. 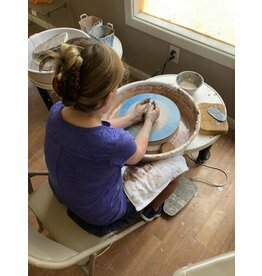 Try out the pottery wheel as a family, with friends or solo. Perfect for family fun time.